Amazon announced this week their newest shopping feature, Amazon Cart, right on the heels of the Amazon Fire TV announcement a few weeks ago. Believe it or not, Amazon Cart makes shopping on Amazon even easier by allowing shoppers to add products to their shopping carts directly from their Twitter stream. 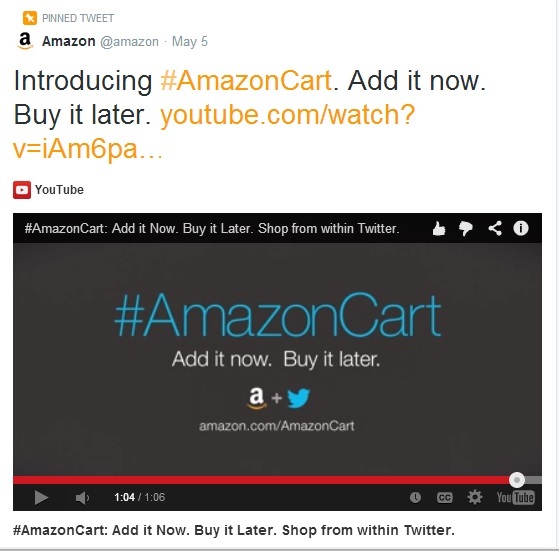 Like most retail brands, Amazon tweets about their products regularly. Now, when you see something you like, simply reply to Amazon’s tweet using “#AmazonCart” and the item will automatically be added to your shopping cart on Amazon.com. When you’re done surfing Twitter, you can log in to your Amazon account and purchase the items you reserved earlier that day. When shoppers place an item in their cart they’ll get a tweet from @MyAmazon plus an email from Amazon saying the item was successfully added to the cart. This is done in an effort to mitigate unwanted purchases from landing in your cart by accident, but it also brings to mind some security concerns shoppers should consider when using the new service. Most of us use our smartphone as a mobile command center, with the apps and data we use daily all in one place. If your Amazon app automatically signs you in on your phone you put yourself at risk for unwanted purchases, should your phone ever land in the wrong hands. Make sure your personal information is protected so you can shop worry free!